Adding insulation to new construction or to an existing home can help reduce utility bills and create a more comfortable environment. Some homeowners are committed to insulating their home, but not sure where to start. These are some of the specific locations of the home where you should insulate. In addition to the below information, you can also view our interactive home insulation guide which goes into additional detail on the specific types of insulation in each of these areas. Arguably the most important space in the home to insulate is the attic. This is primarily because heat naturally rises, which means that the attic will hold a lot of the heat generated in the home. During the winter, having that heat escape through the attic will push up energy bills. Batt, blown-in and spray insulation are three fantastic options for the attic. Just like in the attic, adding insulation to the walls of a home can reduce the energy needed to heat or cool the space, resulting in lower utility bills. In addition, insulated walls can give residents more privacy as insulated walls do a better job of blocking sound. This allows children, teens, parents or roommates get along better. Although heat rises, a lot of conditioned air can still be lost through flooring. This is especially true in the case of floors over unheated areas like garages or basements. Adding in insulation, which could be spray, blow-in or batt insulation, can help protect the heated and cooled air generated by your heating and air conditioning systems. Once again, insulated floors can also help reduce noise, particularly in multi-level homes where residents live on different floors. Whether ventilated or unventilated, adding insulation to a crawlspace can be a smart move for an energy aware homeowner. Insulated crawlspaces can help retain heat throughout the house, but it can also ensure that pipes and ductwork within the crawlspace can’t freeze, even when outdoor temperatures are extraordinarily low. This is one part of the house where insulation is often overlooked, but it can have tremendous benefits for a homeowner. 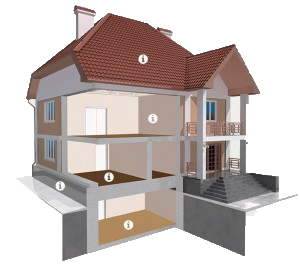 In a finished basement, insulation can render the room into a suitable living space, adding square footage to the home. Even an unfinished basement can have insulated floors to help retain heat in the home. To learn more about the five areas in your house that should be insulated, view our interactive home insulation guide. Or to schedule an appointment for free quote, contact USI online. USI believes that excellence in every step of the process and ensures timely completion and quality of service, time after time.